My first recollection of Aruna Roy is of a small, intense woman sitting behind a large wooden desk piled high with papers in a government office in north Delhi. As university students, we were somewhat in awe of alumni who had made it into the hallowed portals of the civil and administrative services. At that time, for many who entered the services, idealism was the catalyst, commitment the driver. Aruna Roy is one of those. Disillusionment came quickly enough, but few left, and even fewer left to put their commitment, energy and passion into something different and more meaningful. Aruna Roy, born to Tamil parents and brought up in a totally secular tradition, is one of those who did. Six years (1968-1975) in the IAS were enough to convince her that reality lay elsewhere. Involving people across the board, the campaign began to spread its message via jan sunvais (public hearings), dharnas (one for as long as 40 days in Beawar village! ), hunger strikes and padayatras. Ordinary people became involved in the hundreds: giving food, money, water, tea and great support. Government officials were shamed into attending, forced into responding to questions, asked by those they claimed to represent. "The RTI campaign," in Aruna's words, "was created to ask for a share of state power. Democracy gives us the right to govern ourselves, and MKSS has been a space in which the poor have demanded this right." But for MKSS activists, democratic functioning also needs to be fully transparent, which is why they're unwilling to accept the government's recent attempts to water down the RTI Act. 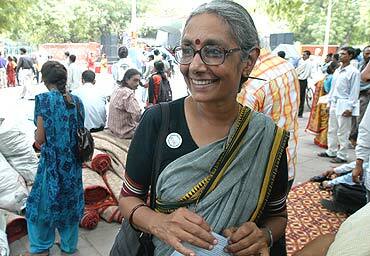 The same uncompromising idealism led to Aruna Roy resigning from the National Advisory Council of the UPA government. For Aruna, confronting the State, and negotiating with it, is important and necessary, but so's the right to exit, if negotiations fail. The poor have been Aruna's support and inspiration for the many years she has worked. As she puts it, "I owe my ideas to the clarity of others, my courage to being with people who confront injustice with fearlessness, my hope to the persistence and resilience of men and women struggling to get themselves heard, my generosity to the poor family that shared its last roti with me, and my sense of well-being to the many who have supported me in life."